Before we talk about specific apartment marketing strategies that you can implement for your community, let’s look at why PPC marketing is something you should consider. While you can focus your entire marketing budgets on billboards, newspapers, and even online listings, you will be missing out on quality leads if you don’t include PPC marketing. 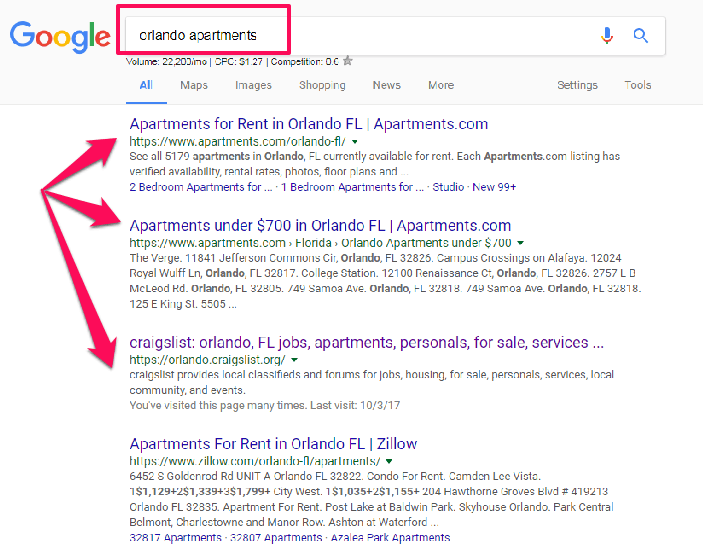 Here is a screenshot when you look for “Orlando apartments” in Google. You will notice that the top results are from an apartment renting boards like Zillow, Apartments.com, and Craigslist. While you should leverage these listing sites as part of your Internet marketing strategy to help you secure the necessary amount of leases each month, you should be wary of having these sites control your brand’s message and image online. You can use Google Ads campaigns to help you reach your targeted audience, and using Google Ads extensions is a great way to boost interaction with your audience for only a little more time and money. You should take advantage of every tool at your disposal to position your apartment community at the forefront of your competition and ensure that you control the entire journey that your customers go through as they research, choose, and sign a lease with you. PPC marketing is a powerful tool that you can leverage to ensure that your apartment property is visible, positioned high on SERPs, and drives qualified customers to your apartment website. Promoting your property and the benefits of your community with PPC marketing means that you will capture the top spots on Google and other search engines with a personalized marketing message that you can tailor to your specific audience. Why Do People Choose Your Apartment Community? Just like any other product or service, your apartment has specific competitive advantages when compared to your competition. Perhaps you are pet-friendly, you have a 24/7 fitness center, or you have a parking garage that tenants can use. These are all features of your apartment that you want to highlight in your online marketing messages. Since you are selling a physical good and your apartment is in a fixed location, you will need to focus your marketing dollars on only people who are qualified to lease from you. This means that you should not target people who are not interested, able, or geographically located outside of an acceptable distance from your apartment community. So, if you want to succeed in apartment real estate marketing, you will have to narrow down your list to a very few number of folks who are looking to rent an apartment like yours in your location, right now. This is why PPC marketing is an excellent tool for you to use in your apartment marketing strategy. You can isolate who you want your ads to reach based on different parameters. Since you work with limited time and resources, you want to maximize every dollar you spend when advertising your apartment complex. You don’t need a big budget or a large staff to properly market your apartment community if you know how to use each channel and drive conversions. This means cutting all spending that does not directly contribute to your business strategy. This is why PPC marketing is an excellent choice to include as part of your holistic online apartment marketing strategy. Not everyone in a city is looking for a rental property like your apartment community. If a person owns his or her home, then it’s almost impossible that he will ever think of signing a lease with you. So, in your apartment AdWords Marketing campaign, you’ll want to eliminate targeting on people who own their own homes. For those people who are looking for an apartment to rent, you will need to position your residence based on their unique needs. If your apartment is located in a popular area of your city, then you can be sure that residents will be drawn to the location. This means that your PPC ads should highlight the site and other amenities that are important to your readers. Apartments can be described as a hyper-local product, so you should only target those people who’re planning to reside in your city. And, to make this a little more complicated, these target customers may not be living in your town when they begin their search. As we discussed above, the most qualified people who want to rent from you are likely those who live in your city. This means that you should think about where people are when they look for your apartment building and focus your advertising budget on reaching those areas. This strategy is called Geotargeting, and you can quickly isolate where your PPC ads appear by optimizing the “Locations Settings” in your AdWords account. Typically, you will want to include the most significant relevant geographic location to show your PPC ads. For example, if your apartment is in Ocoee, FL, then you might want to allow your ads to show to people in the greater Orlando, FL metro area. Following this approach will open your ads to more views so you might get more irrelevant clicks, but since Ocoee, FL is within driving range of most of Orlando, FL, it can be smart to show your ads. This process of consideration is based on the geographical location of your apartment community, and the anticipated intent of potential renters. On average, you should only open your ads up to more significant geographic locations if you have the marketing budget to support that initiative. If you are working with a meager marketing budget, then you might want to start with a smaller area and then grow as you optimize and learn more about PPC marketing for your apartment. One thing to remember is that some cities have the same name as cities in another state. In these cases, you should be sure to research if your city’s name is also found in another state and add that city, state combination to your negative keyword list. 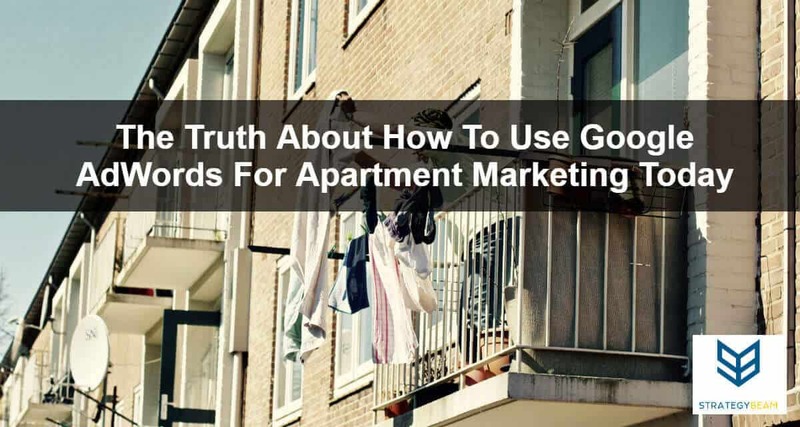 Branded keywords are terms and phrases that include your apartment complex in them. These terms indicate a high degree of user intent because when someone searches for your property, they are likely looking for information on how to sign a lease for you or find more information about your community. This makes it imperative to include branded keywords in your PPC campaigns for your apartment marketing strategy. These keywords will drive qualified leads and a low cost, plus it will help you build a defensive plan from your competition stealing your potential tenants. Bidding on branded keywords can help you reach your goal for signed leases each month because more of your customers are looking for your apartment on mobile devices. Since your ideal renter lives in your city, they likely see your signs as they drive throughout the day. By bidding on branded keywords, you will position your apartment at the top of search engines so when they search for your community; you are the first result they see. Along with establishing your apartment’s position for attracting new residents, you are can also use branded keywords as a defensive strategy. Some of your competitors could bid on your community name as a way to detract interested renters from contacting your apartment. 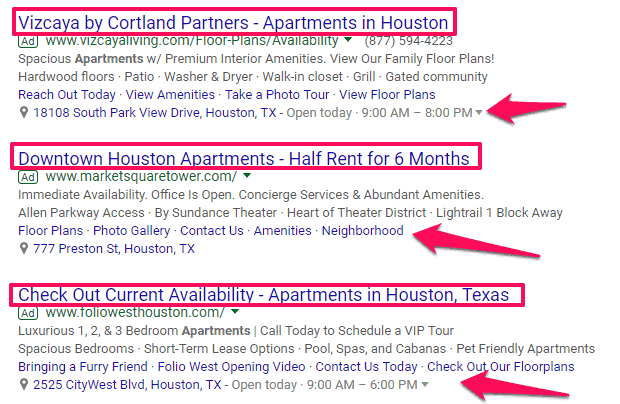 As we have seen in the examples above, you can use keywords to attract qualified tenants to your website through PPC marketing so they can learn more about your property or get in contact with your leasing office. However, you should also consider ways to limit the terms that trigger your ads, since some keywords indicate low buyer intent. As you can see these terms will only be used by people who are not in the buyer mindset, so you should restrict your ads from showing to these people by adding those negative keywords to your PPC campaign. This strategy will help you conserve your PPC marketing budget and maximize clicks from qualified and interested tenants. The goal of using negative keywords in your apartment PPC campaign is to make sure that your ads are only reaching prospective tenants and not current residents. You can rely on organic SEO to inform current tenants about your pool hours, etc., and since you pay each time someone clicks on your PPC ads you want to make sure that your ads are only appearing for qualified leads. Using ad extensions in your PPC ads is a great way to share additional information about your community. Ad extensions can help you display relevant information like amenities, benefits, and location of your property without taking up space in your ad copy. The other great thing about ad extensions is that they are a way for you to take up more real estate on the search engine page. Along with being an educational tool, ad extensions also push your competition down on the page and gives you a better position on search engines. If you want to maximize your online marketing budget and ensure you show the information that your audience needs then you should use a right mix of ad extensions. 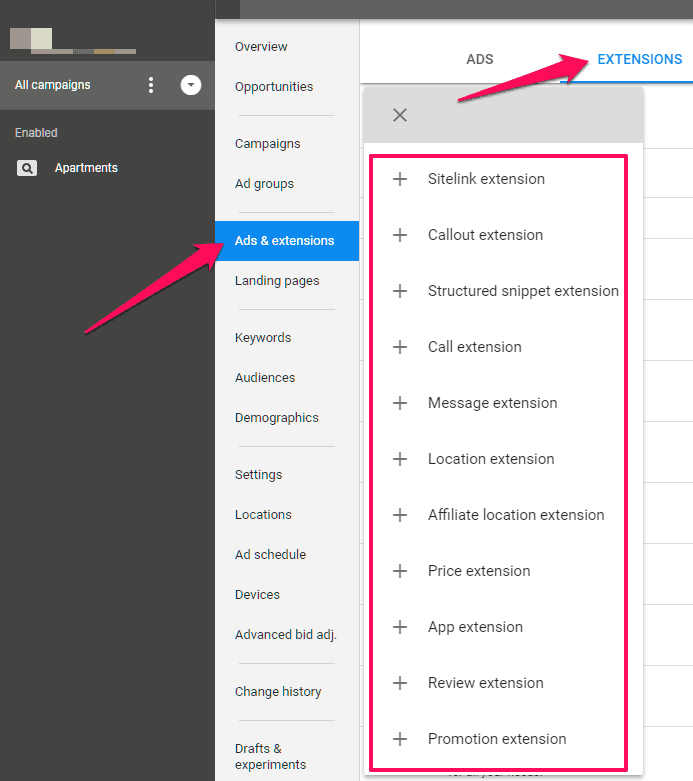 Using ad extensions in your Google AdWords ads will help you share relevant information with your audience while also taking up more real estate on search engines. These add-ons will help you explain your property while not taking up space in your PPC ads. Now that we have looked at some detailed ways to drive qualified traffic to your site and boost leasing opportunities for your apartment, you can begin to build a powerful PPC marketing campaign in no time. However, if you are struggling to figure out all the intricacies of Google AdWords for your apartment marketing strategy then you should consider hiring a PPC marketing professional so you can focus on running your business. Fill out the form below to get started today!